If you are shy then look away, If you like understated, move on. But, if you like to be seen, make a statement and look cool then you must read on. A few weeks ago Salomon asked us to test out a pair of their trail shoes. 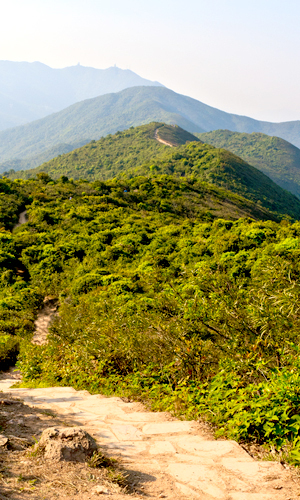 Knowing that we had a man about to head to Hong Kong’s steep trails we jumped at the chance. The Salomon Sense Mantra is a well balanced shoe and surprisingly light at 9.6oz (for our size 9’s). The shoe’s design deliberately promotes the mid-foot – fore foot strike. The shoe is packed with all kinds of technologies that quite simply, hug your feet to give you the protection and support required for a comfortable run. This shoe type is often referred to as a door–to-trail shoe. Good stability on any road surface and great traction and support on the trails. We are inclined to agree. Clearly we didn’t go all the way to Hong Kong to test some shoes, the one downside of them is that they perhaps don’t pack in a suitcase as well as a normal running shoe. Their sole rigidity makes them less malleable, but I was glad to have them on my feet through the hot, humid trails of Hong Kong. Dont take our word for it. Here is an official review by the Salomon Sense Mantra community manager. Fancy getting your hands on a pair? Salomon have agreed to give away one pair ( men's or ladies). Here is how. 3. One lucky winner will be selected at random from all the entries received by midnight (GMT) on the 31st July 2013. Only one entry per household. If you cant wait that long and want to get hold of a pair right now then here is where you can buy a pair.